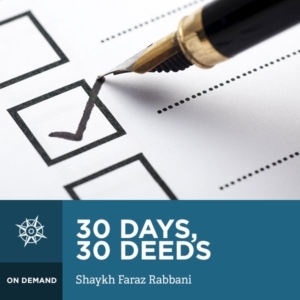 This On-Demand course offers students practical advice from some of the world’s leading scholars including: Shaykh Yahya Rhodus, Shaykh Faraz Rabbani, Shaykh Muhammad Mendes, Dr Ingrid Mattson and more. They share with us 30 simple deeds that have a deep spiritual impact on our lives – and the lives of others. Whether it’s forgiving someone who’s wronged us or sharing a meal with a neighbor, these powerful lessons will remind us of the great gift the Prophet, blessings and peace be upon him,‎ gave us: the best of character. The scholars also remind us to make the intention to put each teaching, each sacred act, into practice. This course helps the Seeker realign his/her practice as it relates to their relationship with their Creator and Creation. Shaykh Yahya Rhodus was born in Kansas City, Missouri. He embraced Islam at the age of 19 in Santa Clara, California, where he began his study of Islam with Shaykh Hamza Yusuf and visiting Mauritanian scholars. In 1998, Shaykh Yahya traveled to Mauritania to pursue a full-time course of study, where he learned from some of Mauritania’s greatest scholars, including the distinguished, Murabit al-Hajj. He also spent an interim period in Damascus, Syria where he received formal education in the Arabic language, grammar, and Qur’anic recitation. In 2000, Shaykh Yahya moved to Tarim, Yemen to continue his studies at the prestigious learning institute, Dar al-Mustafa. There, he spent his formative years studying foundational Islamic sciences with Habib ‘Umar bin Hafiz, Habib ‘Ali al-Jifri, and other scholars of Tarim. The scholars of Tarim are heirs of the spiritual way of Imam al-Ghazali as taught by the great sage of Arabia, Imam Abdullah ibn ‘Alawi al-Haddad. At the hands of these scholars, Shaykh Yahya has studied and applied the book that he teaches in this course. Dr. Ingrid Mattson is the London and Windsor Community Chair in Islamic Studies at Huron University College at Western University in Canada. Dr. Mattson was educated in Canada and the United States, earning a PhD from the University of Chicago in 1999. From 1998 to 2012 she was Professor of Islamic Studies at Hartford Seminary in CT where she developed and directed the first accredited graduate program for Muslim chaplains in America, and served as Director of the Macdonald Center for the Study of Islam and Christian-Muslim Relations. From 2001-2010 Dr. Mattson served as vice-president, then as president of the Islamic Society of North America (USA), the first woman to serve in either position. Her writings, both academic and public, focus primarily Qur’an interpretation, Islamic theological ethics and interfaith relations. Her book, The Story of the Qur’an, is an academic best-seller and was chosen by the US National Endowment for the Humanities for inclusion in its “Bridging Cultures” program. Dr. Mattson is a Senior Fellow of the Royal Aal al-Bayt Institute for Islamic Thought in Amman, Jordan. From 2009-2010, Dr. Mattson was a member of the Interfaith Taskforce of the White House Office of Faith-Based and Neighborhood Partnerships; in 2008 she was on the Council of Global Leaders of the C-100 of the World Economic Forum; from 2007-2008, she was a member of the Leadership Group of the U.S.-Muslim Engagement Project (USME). Dr. Mattson is the recipient of numerous awards as well as honorary doctorates from Trinity College, Hartford, and the Chicago Theological Seminary. She is frequently consulted by the media and has served as an expert witness. Visit Dr. Mattson’s website. Walead Mohammed Mosaad is a teacher and researcher of the Islamic sciences. He is the Director of Muslim Student Life at Lehigh University in Bethlehem, Pennsylvania and an adjunct professor of Ethics in the philosophy department at the same university.. He has completed degrees from Rutgers University, the Fath Islamic Seminary in Damascus, al-Azhar University in Cairo, the University of Liverpool, and a PhD in Arab and Islamic Studies at the University of Exeter in the UK. He has lectured on various topics of interest, including Muslims as minorities, interfaith understanding, and the importance of purification and spirituality in addressing the human condition. Amjad Tarsin was born and raised in Ann Arbor, Michigan. He obtained his Bachelors of Arts at the University of Michigan in English Literature and Islamic Studies. After completing his BA, Amjad spent an intensive year studying at the illustrious Dar al-Mustafa for Islamic Sciences in Tarim, Yemen. He then enrolled at Hartford Seminary’s Islamic Chaplaincy program where he completed his Master’s Degree. In 2012 he was hired by the Muslim Chaplaincy of Toronto as Canada’s first full-time Muslim Chaplain serving at a university. He is currently the Muslim Chaplaincy of Toronto’s Executive Director and Head Chaplain. He also teaches at SeekersHub Toronto. He lives in the Greater Toronto Area with his wife and two children.